Parnell Heritage has a very special event within the Festival on Sunday 25 September from 3-5.00pm at the Titoki Room Jubilee Building, Parnell Road. Richard Gardiner, our invited guest from Christchurch, builds miniature models of historic homes and buildings (see photo above). In some cases, when homes have been lost, these models help in the healing process for people who have lived in and loved these places. 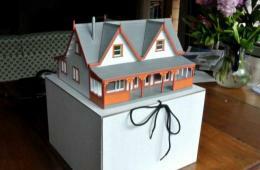 Also these models provide wonderful memories of family homes for future generations. Refreshments will be provided – for catering purposes, please advise if you would like to attend either by email sue@parnellheritage.org.nz or call 09 846 7661. $10 entry payable on the day.